The Every Student Succeeds Act (ESSA) presents US educators and local and state legislators with a rare opportunity: to reconceive schooling and education funding to better address students’ needs. Richard DuFour, Douglas Reeves, and Rebecca DuFour showcase how to make the most of this opportunity by fully committing to the Professional Learning Communities at Work™ process, which holds the greatest potential for maximizing student achievement. Explains the roles federal and state governments play in K-12 education funding with the adoption of ESSA and how it relates to past educational reforms such as ESEA and No Child Left Behind. 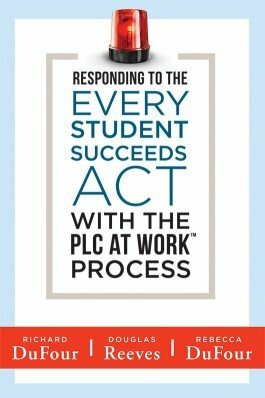 Emphasizes the importance of using the PLC at Work™ process to respond to ESSA. Provides the strategies and mindsets teachers, district leaders, and states should implement to enhance student learning. Presents the right work PLC schools at any level should engage in to support student and adult learning. Highlights indicators of school-level accountability and system accountability, as well as an accountability framework states should use to promote school improvement and success. Anthony Muhammad, author and educational consultant.